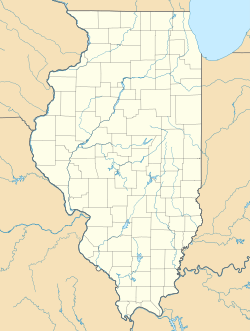 Rockford High School (sometimes referred to as Rockford Central High School) is a defunct high school of Rockford Public School District 205 in Rockford, Illinois. Opened in 1885, Rockford High School was the first school opened by the newly formed (citywide) school district. Standing for 130 years, Rockford High School would serve as a high school from 1885 until 1940, when city growth necessitated its replacement with two separate high schools, Rockford East and Rockford West. From 1940 to 2011, the building was repurposed, serving as the administration offices of the school district. As of the 2017-2018 school year, Rockford Public School District 205 attend four high schools. In 2014, Rockford Public School District 205 sold the property to the City of Rockford; as part of a nearby redevelopment project, the Rockford High School building was demolished in 2015. Prior to providing a central location for education, students attended two separate school districts, one being located on the East side of the Rock River, the other on the West side. These school districts were established in 1854, and opened buildings in 1857. By 1862, each district established a high school, creating an East-vs-West issue that would continue on for 20 years, finally uniting in 1884. In 1884, the two districts came together and established a single high school located at 201 South Madison Street. The first commencement included twenty graduates in 1885. About 100 total students were enrolled in Rockford High School during its inaugural year. That number grew to 600 by 1900 and by the year 1940, that number would multiply to nearly 3,600 students. By 1935, the attendance at the single high school grew too large. The board of education decided it would be best to, once again, establish two new high schools on the East and West sides of the Rock River. In September 1940, Rockford East and Rockford West High Schools opened. Rockford West, located on North Rockton Avenue on the Northwest side of the city, remained open for 48 years as a high school. It now serves as West Middle School for the Rockford Public School System. Rockford East, located on Charles Street, is still a functioning high school and maintains the traditions of Rockford High School. Rockford High School was built as two separate buildings attached by an underground hallway. This hallway became known as "Rat Alley". It contained rows of wooden lockers and was only accessible by walking through the "haunted area" also known as the shop. It was the first high school in the United States to organize a band that played at the halftime of a football game, now known as a marching band. The Annual, or yearbook as it is called now, was entitled "The Owl". It was founded in 1890 and has been published continually since 1892. Rockford was the second high school in the country to establish a yearbook. Rockford's baseball diamonds were used by the Rockford Peaches girls professional baseball team starting in 1940. Girls basketball preceded the boys program. The first girls basketball team was formed in 1901. The 1903 squad gained the school a championship by defeating a Polo squad that had previously been undefeated followed by a victory over Freeport in the championship of "Northern Illinois outside of Cook County" with a final score of 10–6. The building was home to Rockford Public School District's central offices and board of education until February 2012. The school's colors were red and black with a nickname based on those colors: the RAB's for Red And Blacks. Rockford East continues to use the nickname, adding an E to the front, creating the word "E-Rabs". "Let us voice our loy-al-ty, in a stir-ring, ring-ing cheer. For the team that fights so splen-did-ly. For the colors we re-vere - Hoorah! Rah! Go Rockford go! Right at the foe! Go, Rockford go! Hoorah! Rah! So go Rockford go! We're cheering you nearing the goal line, Rockford go! Victory we must know (Rah! Rah! Rah!)" Rockford was considered a very large school for the IHSA and because of their size, they had a tremendous amount of athletic success. The RABS overall won eight state championships, including three in boys basketball (1911, 1919, 1939), four in track and field (1896, 1927, 1933, 1935), as well as a swimming championship in 1933. Rockford became the first school to win three IHSA championships in Basketball. Based on the IHSA Website (www.ihsa.org), Rockford saw more success from 1910 to 1940 than any other school in the state. During that 30-year span, the RABS not only won three championships, they qualified for the state tournament 12 times.. The IHSA began hosting a statewide championship for basketball in 1908. Rockford chose not to participate in the inaugural IHSA State Tournament because they were already considered "Champions of the State" and did not want to defend their title in this new tournament. More of what can be expanded on this topic is mentioned in a chapter of the book "100 Years of March Madness" by Scott Johnson, among others. Rockford first fielded a football team in 1893. During the history of the school, 405 football games were played with the RABS winning 262 of them. Besides basketball, Rockford's track and field team excelled above all others. The RABS won four of the school's eight state championships in the arena of track and field. Between 1895 and 1940, Rockford placed in the top 10 of competing schools 11 times, all with the same head coach, Charles E. Beyer. The Rockford Board of Education voted Tuesday, August 24, 2011, to purchase the former Amcore financial headquarters building at 501 7th Street, Rockford, Illinois, at a cost of $1.825 million. This decision was because the board would have spent $1.7 million on the state-mandated repairs required with the current building. The previous owner of the building was the Federal Deposit Insurance Corporation. As of February 2014, the district determined it is spending about $3,000 a month to maintain the building. The city of Rockford is looking to build a $21 million indoor sports facility adjacent to the former high school/administration building and would like to put a 115-spot parking lot in its place. Members of the Rockford School Board Operations Committee voted in favor of the idea and, according to the agreement with the city, the school district would demolish the old building by August. In turn, the city would give the district goods and services in the same amount minus $180,000, estimated five-year maintenance expenses at the building. The estimated cost to tear down the building and perform any necessary environmental clean up is $725,000. The goods and services the city promises in the agreement range from road salt, trees, sidewalks for elementary schools and the vacating of an alley near East High School to help make room for a new fieldhouse. On September 23, 2014, the Rockford School Board formalized an agreement with the city of Rockford to tear down the building at a cost of $668,804 and donate the one-acre parcel of land to the city in order to create a parking area for the proposed UW Health Sports Factory. Demolition of the building took place in March 2015. John Bayard Anderson (1939), 10 term member of the U.S. House of Representatives, 1961-1981. Barbara Hale (1938), an American actress best known for her role as legal secretary Della Street on more than 250 episodes of the long-running Perry Mason television series. Lawrence Walquist (1918), a professional American football player who played quarterback for nine seasons for the Chicago Bears. Gordon Tullock (1939), an economist and professor of law and Economics at the George Mason University School of Law. Albert Spalding (1868), an American pitcher, manager, and executive in the early years of professional baseball, and the co-founder of A.G. Spalding sporting goods company. ^ a b Miriam C. Carlson, "The Rise and Fall of Rockford Central High School," Illinois History, vol. 18 (Dec. 1998). ^ "Rockford School District to demolish former administration building". 2014-09-24. Retrieved 2016-06-06. This page was last edited on 17 February 2019, at 18:36 (UTC).